In 1890 the National Woman Suffrage Association (NWSA) and the American Woman Suffrage Association (AWSA) merged in 1890 to form the National American Woman Suffrage Association (NAWSA). The leaders of this new organisation include Elizabeth Cady Stanton, Susan B. Anthony, Carrie Chapman Catt, Frances Willard, Matilda Joslyn Gage and Anna Howard Shaw. 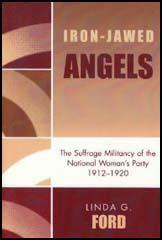 Some younger members of the NAWSA became impatient about the progress the organisation was making. While studying at the School of Economics and Political Science (LSE) in London, Alice Paul, joined the militant Women's Social and Political Union (WSPU). Like other members of the WSPU, Paul's activities resulted in her being arrested and imprisoned three times. Like other suffragettes she went on hunger strike and was forced-fed. When Alice Paul returned home to the United States and in 1913 she joined with Lucy Burns, Mabel Vernon, Olympia Brown, Mary Ritter Beard, Belle LaFollette, Doris Stevens, Helen Keller, Maria Montessori, Dorothy Day and Crystal Eastman to form the Congressional Union for Women Suffrage (CUWS) and attempted to introduce the militant methods used by the Women's Social and Political Union in Britain. This included organizing huge demonstrations and the daily picketing of the White House. Over the next couple of years the police arrested nearly 500 women for loitering and 168 were jailed for "obstructing traffic". Alice Paul was sentenced to seven months imprisonment but after going on hunger strike she was released. By 1914 the CUWS had a membership of 4,500 and had raised more than $50,000 for its campaign. The CUWS also had its own magazine, the Suffragist and published articles by leading members such as Alice Paul, Lucy Burns and Inez Milholland. Its main cartoonist was the outstanding artist, Nina Allender. The journal also published cartoons produced by Cornelia Barns, Boardman Robinson and Marrietta Andrews. In 1916 the Congressional Union for Women Suffrage became the National Woman's Party. This new organization was criticised by pressure groups such as the National Association for the Advancement of Coloured People for not supporting voting rights of black women. At one demonstration outside of the White House leaders of the party asked the black suffragist, Ida Wells-Barnett, not to march with other members. It was feared that identification with black civil rights would lose the support of white women in the South. Despite pressure from people like Mary White Ovington, leaders of the CUWS such as Alice Paul and Lucy Burns refused to publicly state that she endorsed black female suffrage. 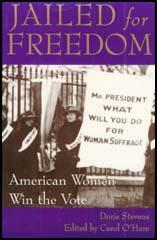 In January, 1918, Woodrow Wilson announced that women's suffrage was urgently needed as a "war measure". The House of Representatives passed the federal woman suffrage amendment 274 to 136 but it was opposed in the Senate and was defeated in September 1918. Another attempt in February 1919 also ended in failure. In May 1919 the House of Representatives again passed the amendment (304 to 89) and on 4th June 1919 the Senate finally gave in and passed it by 66 to 30. On 26th August 1920 the Nineteenth Amendment was certified by the Secretary of State, when Tennessee, the thirty-sixth and final state needed, signed for ratification. Finding that a suffrage committee in the House and a report in the Senate had not silenced our banners, the administration cast about for another plan by which to stop the picketing. This time they turned desperately to longer terms of imprisonment. They were, indeed, hard pressed when they could choose such a cruel and stupid course. Our answer to this policy was more women on the picket line on the outside, and a protest on the inside of prison. We decided, in the face of extended imprisonment, to demand to be treated as political prisoners. We felt that, as a matter of principle, this was the dignified and self-respecting thing to do, since we had offended politically, not criminally. We believed further that a determined, organized effort to make clear to a wider public the political nature of the offense would intensify the administration's embarrassment and so accelerate their final surrender. It fell to Lucy Burns, vice-chairman of the organization, to be the leader of the new protest. Miss Burns is in appearance the very symbol of woman in revolt. Her abundant and glorious red hair burns and is not consumed - a flaming torch. Her body is strong and vital. It is said that Lucy Stone had the "voice" of the pioneers. Lucy Burns without doubt possessed the "voice" of the modern suffrage movement. Musical, appealing, persuading - she could move the most resistant person. Her talent as an orator is of the kind that makes for instant intimacy with her audience. Her emotional quality is so powerful that her intellectual capacity, which is quite as great, is not always at once perceived. She had no sooner begun to organize her comrades for protest than the officials sensed a "plot" and removed her at once to solitary confinement. But they were too late. Taking the leader only hastened the rebellion. A forlorn piece of paper was discovered on which was written their initial demand. It was then passed from prisoner to prisoner through holes in the wall surrounding leaden pipes, until a finished document had been perfected and signed by all the prisoners. (2) Leaflet written and distributed by Alice Paul outside of the White House. President Wilson and Envoy Root are deceiving Russia. They say "We are a democracy. Help us to win the war so that democracies may survive." We women of America tell you that America is not a democracy. Twenty million women are denied the right to vote. President Wilson is the chief opponent of their national enfranchisement. Help us make this nation really free. Tell our government that it must liberate its people before it can claim free Russia as an ally. At night, in the early morning, all through the day there were cries and shrieks and moans from the patients. It was terrifying. One particularly meloncholy moan used to keep up hour after hour with the regularity of a heart beat. I said to myself, "Now I have to endure this. I have got to live through this somehow. I pretend these moans are the noise of an elevated train, beginning faintly in the distance and getting louder as it comes nearer." Such childish devices were helpful to me. (4) Rose Winslow was in prison with Alice Paul in November 1917. Yesterday was a bad day for me in feeding. I was vomiting continuously during the process. The tube has developed an irritation somewhere that is painful. Don't let them tell you we take this well. Miss Paul vomits much. I do, too, except when I'm not nervous, as I have been every time against my will. We think of the coming feeding all day. It is horrible. May I point out, however, that Mrs. Talbert does represent the colored women of the United States and that no white woman can today represent the colored women of this country. Owing to our caste system, these women are little known by white women and carry on their organization largely distinct from the organizations of your and my race. This being the case, it is surely eminently proper that a meeting which has as one of its objects the honoring of the great feminists of the nineteenth century should have on its program a representative colored woman. Indeed, I think when your statue of Lucretia Mott, Susan B. Anthony and Elizabeth Cady Stanton is unveiled and it is realized that no colored woman has been given any part in your great session, the omission will be keenly felt by thousands of people throughout the country. (8) Rebecca West, reviewed Jailed for Freedom by Doris Stevens in Time and Tide on 24th March, 1922. They (members of the Congressional Union for Women Suffrage) found that the police while constantly arresting them for minute technical offences, would not interfere when they were assaulted by hooligans, and later on led Government-organised crowds of uniformed soldiers and sailors against them. They went to prison and, in an interesting penal institution called the Occoguan workhouse, were fed on worm-crawling food and exposed in insanitary conditions and when they denounced this state of affairs, not only on their own account but (as has always been the gentlemanly suffragist way), on behalf of the ordinary offenders, the administration called to mind a penitentiary in a swamp, which had been declared unfit for human habitation nine years before, and put them there. All this they endured and thereby, without any doubt at all, acquired the vote. With extraordinary naivety the United States Government failed to cover up its tracks and left it patent that it gave women the franchise not because of any consideration of justice, but because they were a nuisance. There was no such magnificent exhibition of the art of climbing down in the grand manner (with classical quotation from Mr. Asquith) as our Parliamentary debate on the passing of the Act. A crude, new country America; but no doubt it will learn.